The next generation of neutrino experiment, DUNE, searches for CP violation in the leptonic sector, to potentially explain the observed Matter-Antimatter asymmetry in the Universe. Such experiments also try to solve the neutrino mass hierarchy problem (m3>m2>m1 or m2>m1>m3?). For those purposes, large samples of neutrino-interaction events are needed which make it necessary to have large neutrino fluxes and large detector target masses. 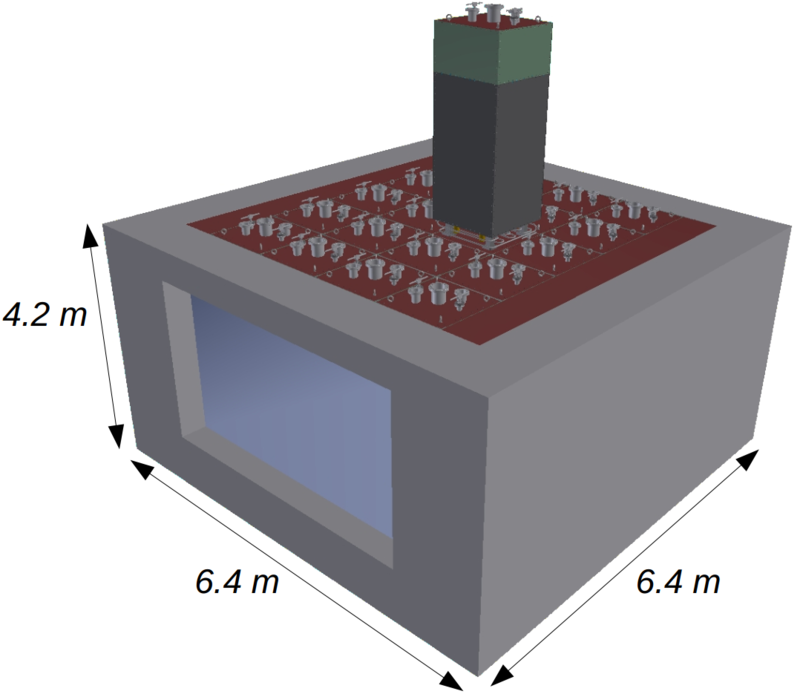 The ArgonCube collaboration proposes an advanced approach for bulding Liquid Argon Time Projection Chambers (LArTPCs). Two principal novelties of ArgonCube are a modular design and a fully pixelated charge readout. Splitting a large detector into independent modules allows for reduced requirements to drift potentials and argon purity which drastically reduces operation risks related to electric breakdown and purity losses, respectively. The pixelated charge readout provides an unambiguous event topology reconstruction, vital to prevent pile up in high multiplicity environments. The scintillation light contained within each module is used to provide precise timing information for neutrino events. A key feature of the modular design is the scalability to a very large acitve detector mass. The following figure shows the design of the DUNE Near Detector, consisting of 4x5 modules, each filled with about 4200 kg of liquid Argon. 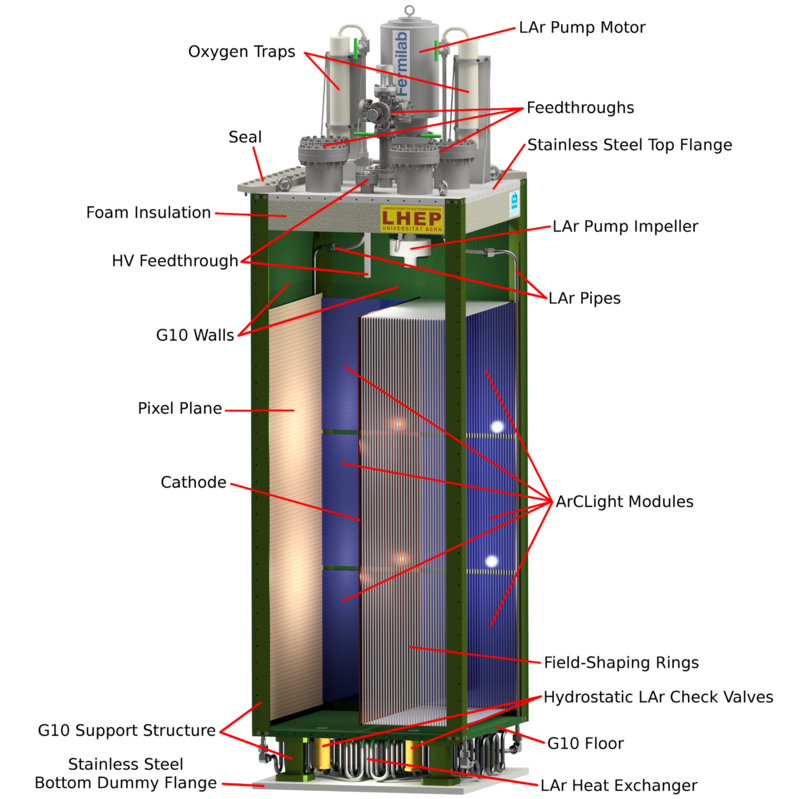 Design of the DUNE (Deep Underground Neutrino Experiment) Near Detector, consisting of 4x5 liquid Argon TPC modules. Cutaway drawing of an ArgonCube module, which consists of two independent time projection chambers (TPCs) separated by the common cathode plane in the middle of the module. The Lawrence Berkeley National Laboratory group produced a pixelated charge readout board with bespoke readout electronics, capable of independently digitising the charge collected at each of the 832 pixels. During a 9 days run in LHEP, in April 2018, this board was tested in a 60cm drift LAr TPC. For the first time a LArTPC was able to provide true, unambiguous, 3D event reconstruction of crossing particles. 60 cm long TPC (left) with the pixelated charge-collection plane (middle). A native 3D event display (right) shows a cosmic muon which produced a delta electron (short track). Charged particles passing through the 60 cm long TPC (left) ionize the argon atoms. Due to an applied electric field the ionization electrons drift toward the pixel plane (middle) allowing for readout the amount of released charge. The raw data can be shown in a native 3D event display (right). The long track most likely corresponds to a cosmic muon which produced a delta electron (short track). Charged particles passing through LAr also produce scintillation light (λ=128 nm). Detecting this light is important to determine t0 for the TPC event (corresponding to the third spatial coordinate). The Bern group and physicists from the JINR in Dubna have developed two complementary ArgonCube Light readouts (ArCLights) for collecting the scintillation light. The working principle of these large-area detectors is based on the trapping of wave-length shifted photons with the aid of dichroic mirrors (Bern prototype) or light guiding fibres (Dubna prototype). The trapped photons are detected with silicon photo-multipliers (SiPMs) at one edge of the sensor. The whole sensor is made of dielectric material and can operate in regions of high electric field. First tests have shown Photon Detection Efficiencies (PDE) of about 1%. There are on-going studies to improve the PDE. The prototype of the Dubna group is based on wavelength shifting light guiding fibres (left). 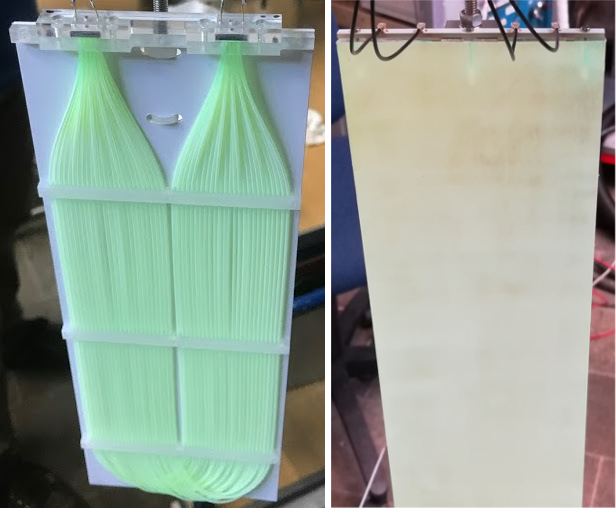 The Bern prototype uses a single piece of mirrored wavelength shifting scintillator (right).